This new Kit Rae adult collectible features solid metal handle parts with an antique metal finish and genuine leather wrapped shaft. 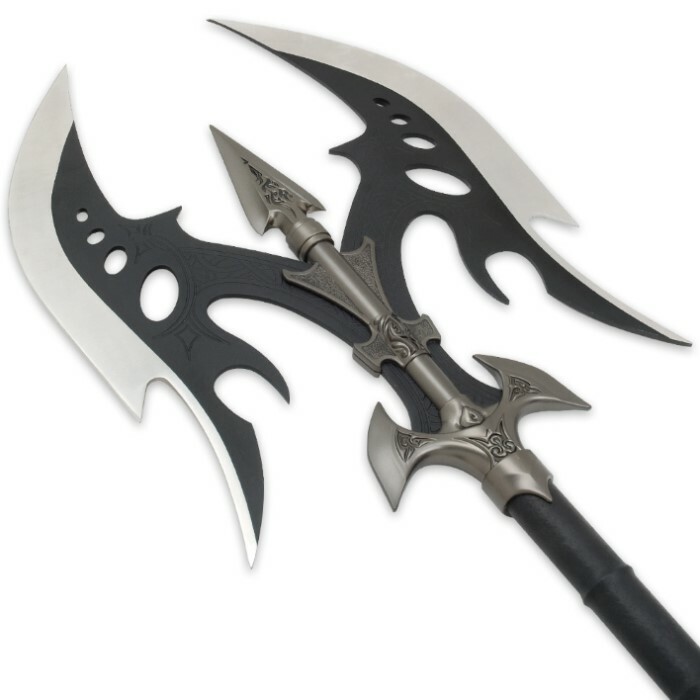 The 15" blades are constructed from 420 stainless steel with fantasy cut outs. Includes art print and certificate of authenticity. 35" overall. 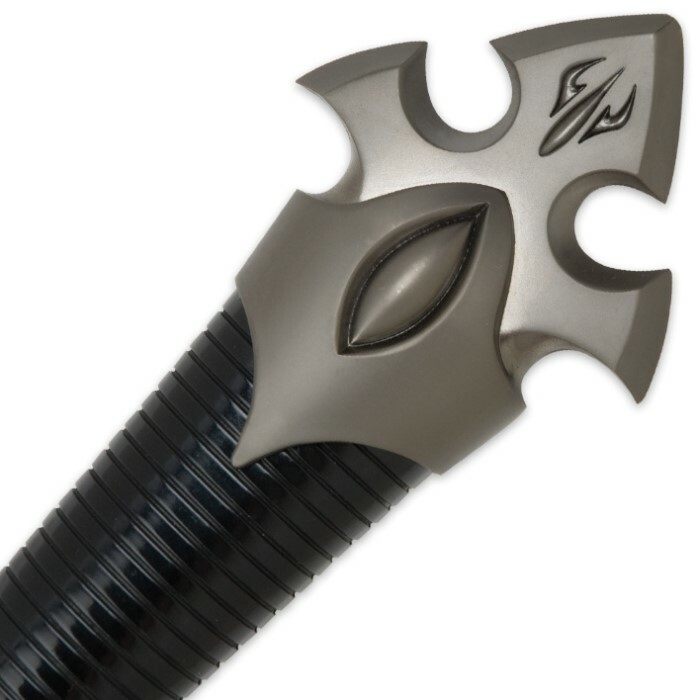 This battle axe is a really nice piece to add to any collection. There was a few flaws with mine but you'll only find them if look really hard for them. Overall it is very well made. It is a heavy axe, but it's well weighted (even though it is a bit lacking in the handle.) Its got a nice design, but the metal could definitely be thicker for a bit of practicality. The concept art is great, i'll probably get it framed, and the metal (after a bit of cleaning) was beautiful. Something I'd definitely recommend it to a friend, and it would make a great gift. The axe is awesome!!!! 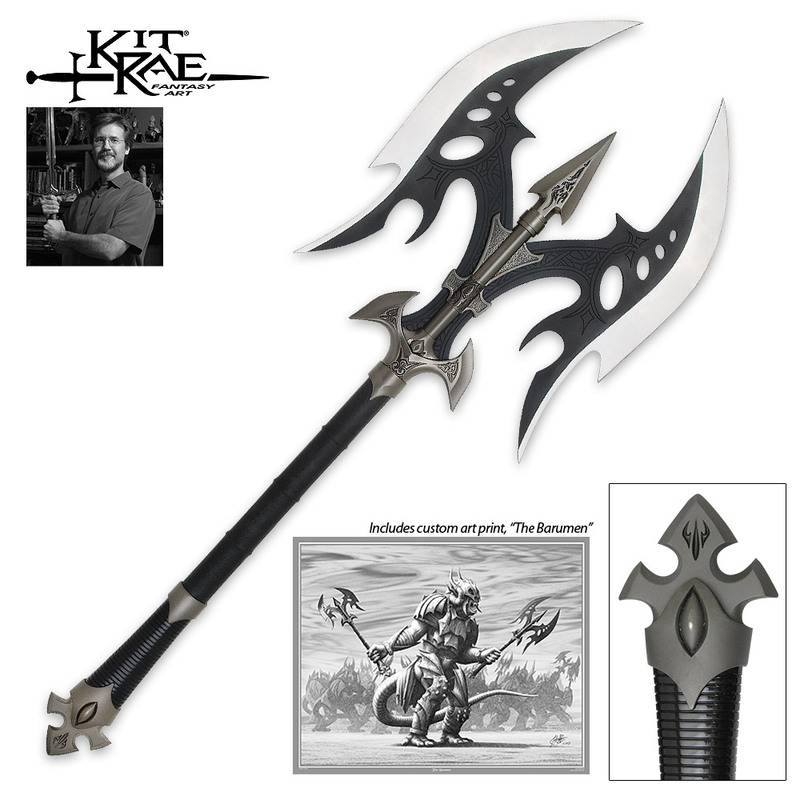 Very well made and heavy...have it hanging on Kit's universal wall plaque and looks great!!! Love the black and white art print that comes with it too...framed it and it looks cool next to the axe Kit Rae's swords of the ancients collection is totally awesome. ..and this axe is a perfect addition to it !!!!! It is very very pretty. I just love it, it was a Christmas gift for my bf and he said it was easy to move and was a little dull, but overall it's very nice and worth the money.